Democratic senatorial candidate Doug Jones speaks during a "get out the vote rally," Dec. 9, 2017, in Birmingham, Ala. Renegade Republican Roy Moore may be plagued by scandal, but it will take more than that to convince the voters of 44th Place North to show up for Democrat Doug Jones on Tuesday. With history and math working against them in deep-red Alabama, Democrats are fighting to energize a winning coalition of African-Americans and moderate Republicans — a delicate balancing act on full display Saturday as Jones and his network of volunteers canvassed the state. Supporters of Democratic senatorial candidate Doug Jones cheer as he comes onstage before he speaks during a "get out the vote rally," Dec. 9, 2017, in Birmingham, Ala.
New Jersey Sen. Cory Booker, one of only two African-Americans in the Senate, was scheduled to appear at Jones’ side later in the day at Alabama State University. And Saturday evening, the Democrat organized two get-out-the-vote concerts expected to draw overwhelmingly white voters, including some open-minded Republicans, in a state that hasn’t elected a Democrat to the Senate in more than a quarter century. FILE - Former Alabama Chief Justice and U.S. Senate candidate Roy Moore speaks at a campaign rally, Dec. 5, 2017, in Fairhope Ala. The 70-year-old Moore is facing multiple accusations of sexual misconduct, including allegations that he molested two teenage girls and pursued romantic relationships with several others while in his 30s. He has largely denied the allegations. The explosive charges, which many Washington Republicans describe as credible, are giving Democrats a once-in-a-generation opportunity to pick up a Senate seat in the Deep South, where Republicans significantly outnumber Democrats. Even if Jones wins on Tuesday, many Democrats expect the GOP to re-claim the seat when the term expires at the end of 2020. Beneath Jones’ biracial and bipartisan balancing act is a complex numbers game that has vexed Alabama Democrats for decades. The party’s core of black voters and white liberals — plus a smidgen of old-guard, more conservative “Southern Democrats” who’ve held on amid the region’s partisan shift — is worth no more than 40 percent in statewide elections. That’s been true in high-turnout elections, with former President Barack Obama twice landing between 38 and 39 percent, and the most recent governor’s race in 2014, when the Democratic nominee pulled 36 percent. African-Americans make up about 25 percent of eligible voters, though Democratic pollster Zac McCrary said Jones needs black voters to comprise 27 percent or more of those who show up at the polls Tuesday. Jones then needs to win 1 in 3 white voters in the state, which would require capturing about 15 percent of Republicans, McCrary said. FILE - Democratic candidate for 6th congressional district Jon Ossoff, right, steps onstage with his fiancee Alisha Kramer to announce he conceded to Republican Karen Handel at his election night gathering in Atlanta, Georgia, June 20, 2017. Such dynamics are difficult to overcome, said Democratic strategist Keenan Pontoni, who managed the campaign of Georgia congressional hopeful Jon Ossoff earlier this year. Ossoff aimed for an upset in the 6th Congressional District of Georgia, but ultimately came up short in Atlanta’s Republican-leaning northern suburbs. Much like Jones, Ossoff used an extensive, data-driven ground game to maximize Democratic support, while using television advertising to strike a moderate, non-partisan tone. Ossoff didn’t have a controversial opponent like Moore, but he ran against Washington dysfunction as a way to reach moderates. Doug Jones' campaign volunteer Dana Ellis, right, talks to Ebonique Jiles and her son, Dec. 9, 2017, in Birmingham, Ala., about voting on Tuesday's senatorial election. 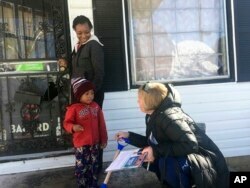 Jones volunteer Dana Ellis, a 64-year-old nurse, navigated icy sidewalks in Birmingham’s Kingston neighborhood, which is overwhelmingly African-American, to ensure likely Jones supporters vote Tuesday. Unlike many states, Alabama doesn’t offer early voting. “Roy Moore will not win if people turn out to vote,” Ellis said. Many voters on the list provided by the campaign didn’t answer their doors Saturday morning. Those who did suggested they would support Jones, even if they didn’t know him well. Oweda Clark, who lives just around the corner from 44th Place North, admits it’s hard being a Democrat in Alabama. But she told Ellis that she plans to vote for Jones anyway. “I don’t like Roy Moore. I don’t like what he stands for,” she said.